CHICAGO, IL--(Marketwire - September 24, 2010) - Favorite morning brews and popular pastries are offered for travelers in a special Chicago Magnificent Mile hotel package that allows guests a sweet and easy way to kick start their day. Distinctive coffees and tantalizing pastries are complimentary for guests who take advantage of the "Starbucks Grab and Go" Courtyard hotel package. Chicago Magnificent Mile visitors will find this tasty hotel package easily fits the bill and their wallet whether traveling to the Windy City for business or pleasure. Chicago visitors will find this great deal a perfect complement to the full-service amenities and unsurpassed service found at the Courtyard, a distinctive standout among downtown Chicago hotels on Magnificent Mile providing a great location for busy shoppers, corporate business professionals or Chicago vacation travelers. Guests booking their accommodations with the "Starbucks Grab and Go" package will receive a complimentary specialty Starbucks beverage of any size along with a complimentary pastry from Starbucks Coffeehouse, conveniently located in the hotel lobby. Rates for this hotel deal start at just $139* and are valid through December 30, 2010 and include deluxe accommodations just minutes from the Loop business district, Navy Pier, Lincoln Park Zoo, McCormick Place and exciting shopping along Chicago's famous Magnificent Mile. Chicago travelers may book their stay online at http://www.marriott.com/hotels/travel/chimm-courtyard-chicago-downtown-magnificent-mile/ by using promotional code P42 or call 1-800-321-2211 for reservation or information. Whether running out the door with Starbucks in hand or savoring every taste sensation while relaxing in the stylish lobby of one of the premier hotels near downtown Chicago, IL, guests at the Courtyard will be well rested and ready to greet the day after a good night's sleep in the Courtyard's newly renovated guest rooms and suites. Luxury bedding ensembles that feature crisp linens, thick mattresses and fluffy down pillows are featured in every room along with complimentary high-speed Internet access, coffee and tea service, cable/satellite service for optimum television viewing and premium movie channels. *Rates are per room per night and valid seven days a week through 12/30/10 based on availability at the time of reservation. Offer does not apply to groups of 10 or more rooms and may not be combined with any other discount or promotion. Please visit hotel website for additional terms and conditions. 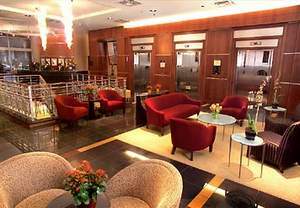 The Courtyard Chicago Downtown/Magnificent Mile Hotel offers travelers comfortable accommodations and convenient access to many businesses and attractions in the downtown Chicago area surrounding the Magnificent Mile. The hotel features an indoor pool and on-site fitness room for relieving the stress of the day and an upscale restaurant, Viand Bar & Kitchen, for contemporary refreshment and relaxation any time as it serves up an American menu for breakfast, lunch and dinner.